Speaking for President Vladimir Putin in Tajikistan on Friday afternoon, Dmitry Peskov announced that no record has been found of Putin awarding the Hero of Russia medal for military valour to Anatoly Chepiga. He also announced there are at least two dozen Vladimir Lenins and Joseph Stalins on Red Square. “We checked it”, Peskov responded to reporting from a NATO information-warfare unit and the British press last Wednesday, claiming Chepiga is a colonel of the Russian military intelligence organization known as GRU; recipient of the Hero of Russia medal in 2014; and the real name of Ruslan Boshirov, one of two men the British authorities have accused of attempting to assassinate Sergei Skripal and his daughter Yulia in Salisbury last March. For details of the British claims and Peskov’s first response, read this. “I have no information that a person with this name was awarded [the medal]” Peskov said. For an edited version of Peskov’s remarks, listed to this tape. 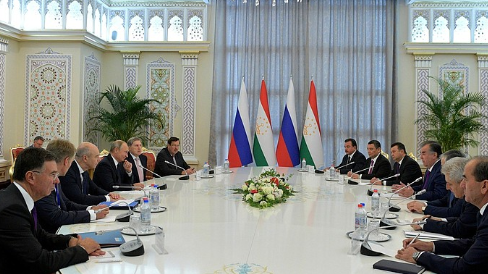 On Friday afternoon, following Peskov’s remarks to reporters, Peskov appeared at this meeting of President Putin with Tajikistan President Emomali Rahmon in Dushanbe. The Kremlin photograph shows Peskov second from the left.